The “after” shot as they both stand now … just waiting for the beads to be added now 😀 Was hoping they’d be finished during the week last week, but I was working mental hours so too tired when I got home, then I was house-sitting the weekend just gone with an active border collie and 3 kitties, and decided not to chance beading! I did manage to finish one other WIP, though, which was another small Christmas ornament – I don’t know why I put this to one side for so long … once I put my mind to it it didn’t take too long at all to add it to the “finished” pile on 20 August. I really like the colours in this one. 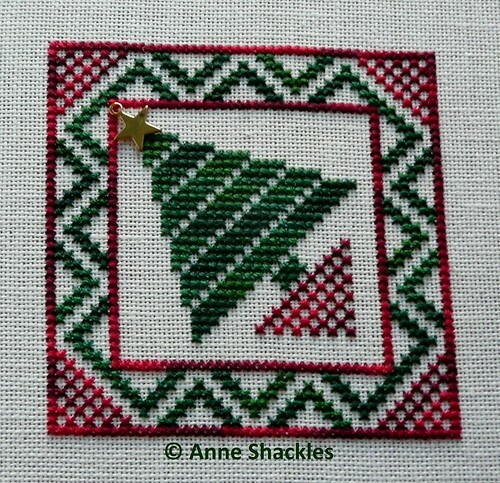 Anne S • This entry was posted in 2012 WIPocalypse, Christmas Ornaments, Finishes, Stash, Stitch-alongs, Works in Progress. Bookmark the permalink. Great Wipocalypse post Ann. Loved it. Really loved looking at all the new stash. Lovely finishes, Anne – don’t the beads make a difference! 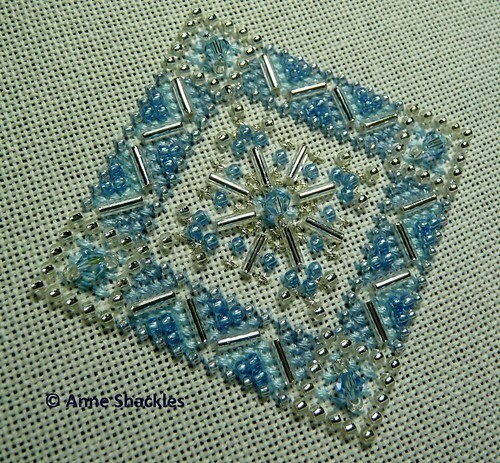 I only use beads on my CQ patchwork blocks, and rarely add them to other cross stitch or embroidery projects, unless instructed to by the pattern. But now I’ve seen what you’ve done, it has inspired me to add some beads to the small Xmas projects I’m planning! There are some lovely smalls there! I really like the Mill Hill design. I do the TUSAL, the WIPocalypse and Theme-a-licious so that guarantees me something to blog about each month! Lovely ornaments! I love the sparkly snowflake too! Great new stash too! Looks like lots of fun new stash. Congrats on your stitching progress. That new, beady ornament looks like a stunner! Great stitching and great stash enhancement!! Your sparkly Blue Snowflake is beautiful!